It’s March Break, so I’m trying to keep the kids entertained without plopping them in front of screens the entire time. We’re going to try to do a craft a day, and I thought I’d share what we did and how we did it so that others can use these same techniques this week (or any time, really). 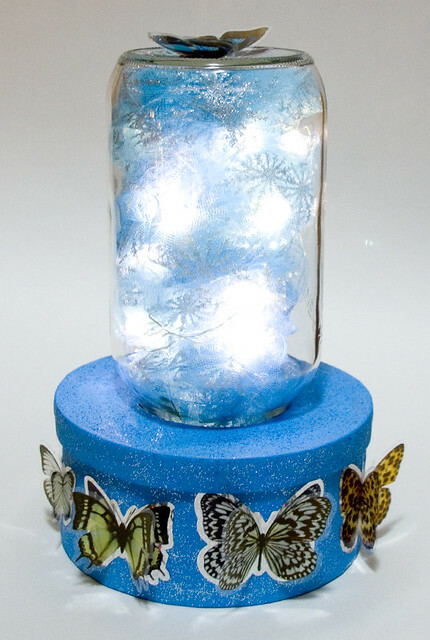 The first craft we did was a fairy light lamp. There’s no wiring required, and for safety’s sake all of the lights are LED and the power source is battery-powered. 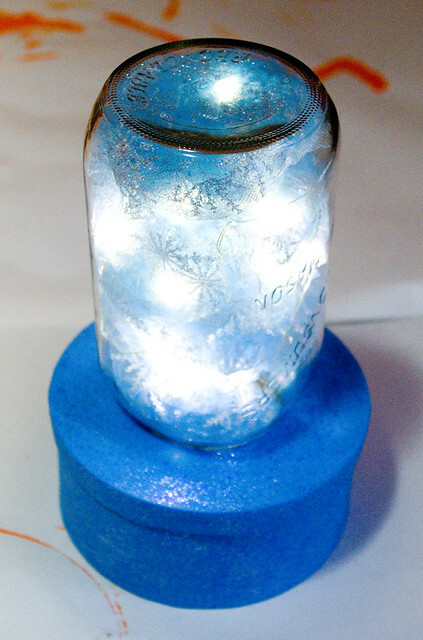 We’ve all seen a string of lights in a jar, but I thought we needed to do something to take it up a notch. If you’re working with younger children, some of these steps will need adult supervision. 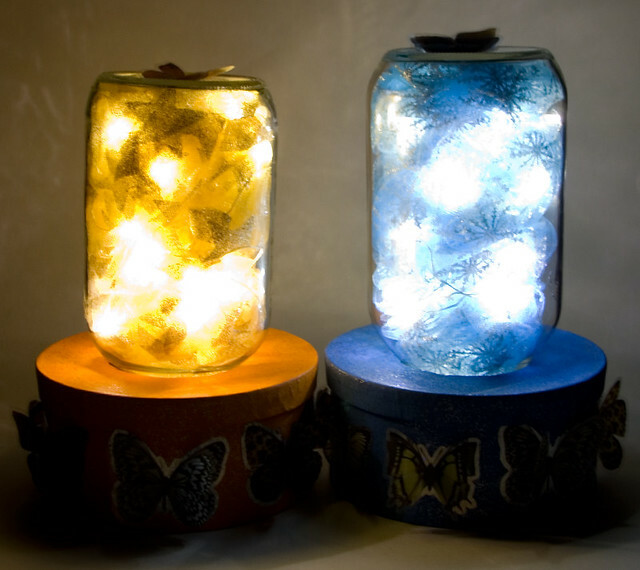 The end result should be an ornamental lamp or night light that the kids can be proud of! As a bonus, all of the materials can be obtained at the local dollar store, or can be made of recycled materials for free. Since there are a few ways to do this craft, be sure to read all of the instructions first, to keep from having to re-do steps! 1. Unscrew the lid from the jar. I used a 1L Mason jar because that’s what fit best with my box, but it’s a very subjective judgement. I also liked the look of a round box, but square or rectangular is fine too. Just make sure it’s the kind of box that has a lid. Don’t worry about a colour or pattern on the box, since it will be covered later. If you want to use a wooden box, that can work too, but you’ll need heavier-duty tools to proceed with the next steps. 2. 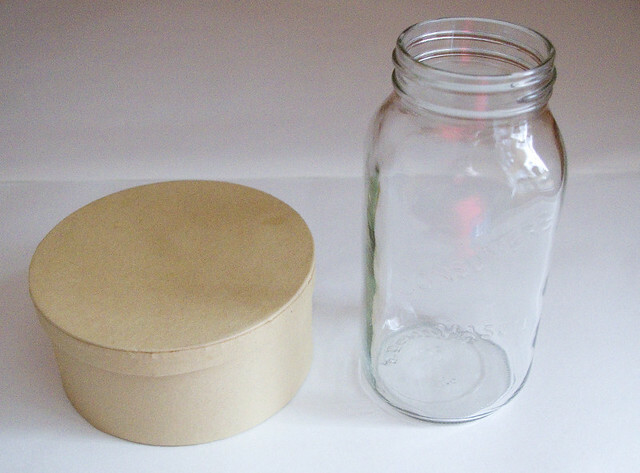 Trace the opening of the jar onto the lid of your box. 3. Using a craft knife, cut a hole along the line that you have traced. Make sure not to use the knife on a surface that you don’t want damaged, since it will make marks on whatever’s underneath the lid! 4. 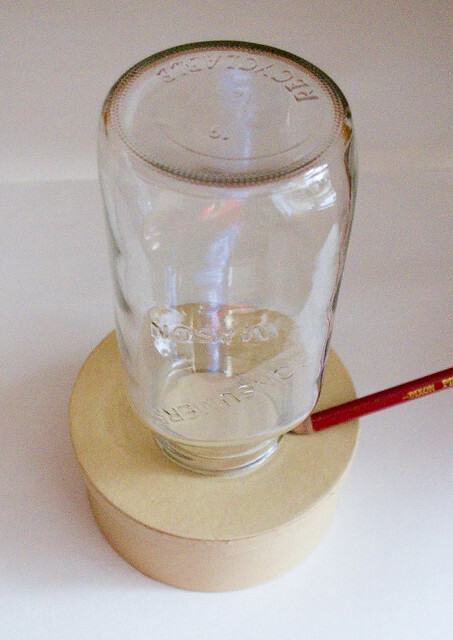 Make sure that the jar fits into the hole as shown. If the fit is too tight, trim off edges of the hole with the craft knife. 5. 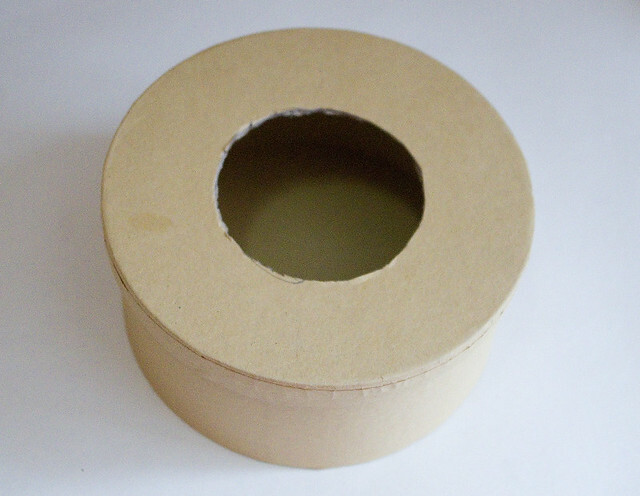 Use a few pieces of duct tape (any colour) to reinforce the cardboard around the hole on the inside of the box. 6. Paint the outside of the box. My kids chose a base coat of their favourite colour, then two coats of glitter paint in different colours. We used acrylic paint, since it is more permanent and covers better than kids’ craft paint. Because of this, we covered our table in craft paper first to protect it — and if you look at the paper under the box, you can see why. Other options to painting include decoupage, stickers, and wrapping the box in pretty paper. No matter what method you choose, make sure that the top and bottom are done separately, since you’ll need to be able to get into the box. 7. Put the batteries into the battery pack of the light string(s). 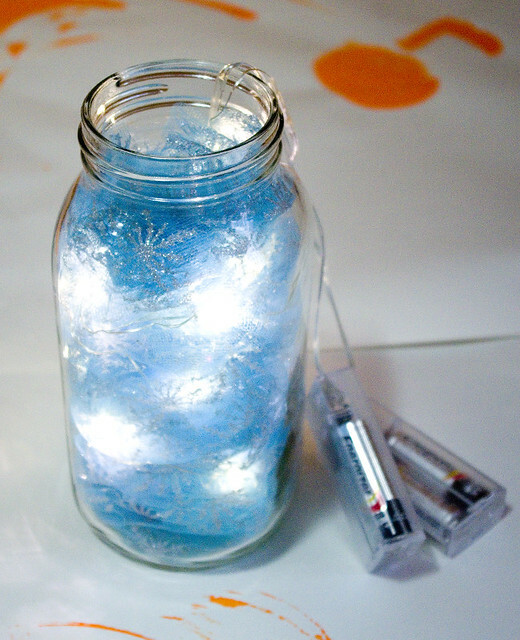 Stuff the diffusing fabric and strings of light into the jar, leaving the battery packs and some cord outside of the jar. I used a cheap tulle (a lightweight, very fine, stiff netting as my diffusing fabric, which is available at most craft stores, fabric stores, and dollar stores in the craft section. A good place to look for this kind of thing is in the Christmas clearance section. 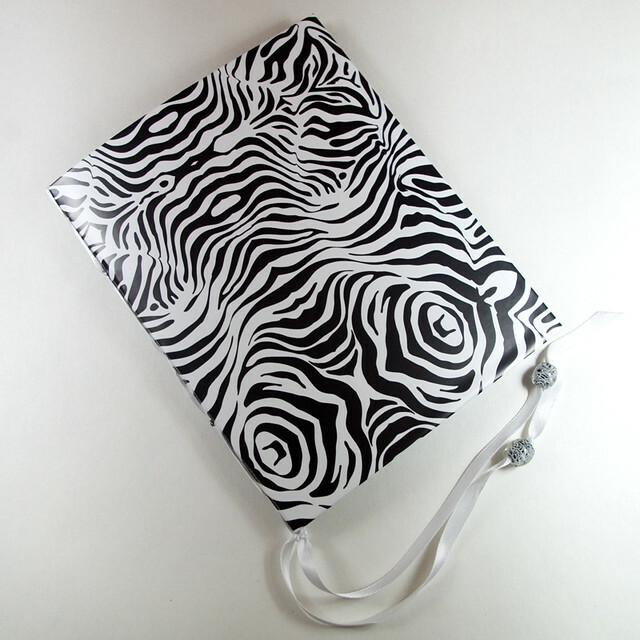 You can use a plain colour or one with a glitter pattern. Whatever you choose, the point of the fabric is to make the light from the LEDs softer, hide the cords, and keep it all in place. Arrange the fabric and lights until they are in a position that you find satisfactory. I found that it helped to do so in low lighting so I could see how the light would shine through. 8. 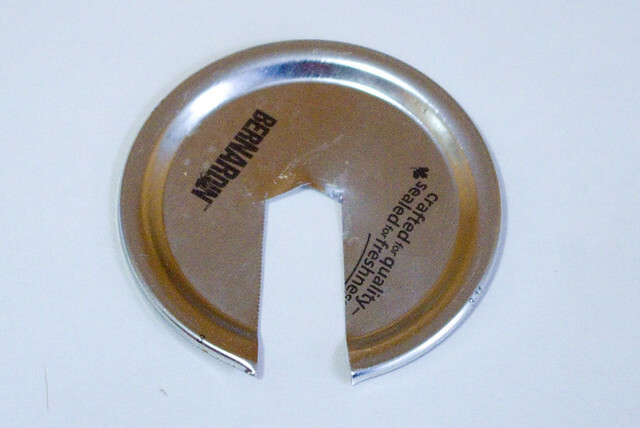 Using the heavy-duty scissors, cut a wide slot into the flat part of the Mason jar lid. 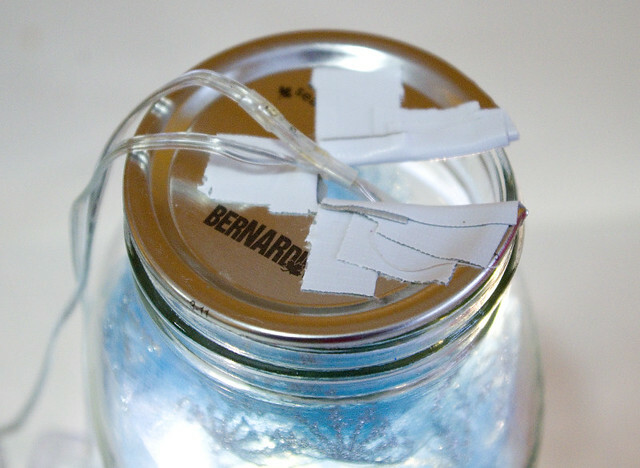 If you are using a recycled jar with a one-piece lid, using a drill make hole large enough to easily pass the light string through. 9. 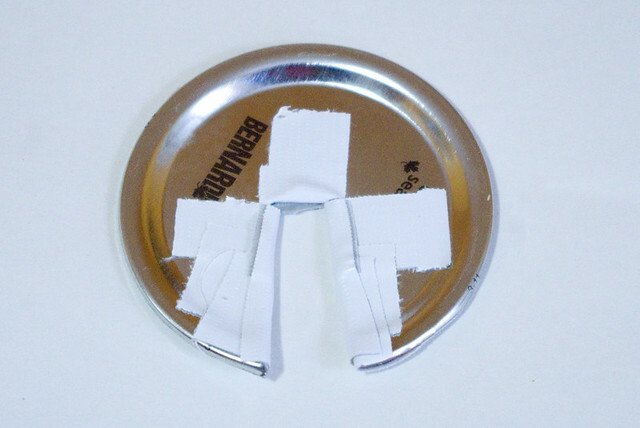 Cut small strips of duct tape (any colour) and use them to cover the sharp edges of the hole in the lid. This will keep little fingers and the wires from the lights from getting cut. 10. Cover the inside of the lid with a piece of coordinating-coloured duct tape. If you don’t have any, a piece of card or colour in a coordinating colour will also work. 11. Thread the light strings through the hole. 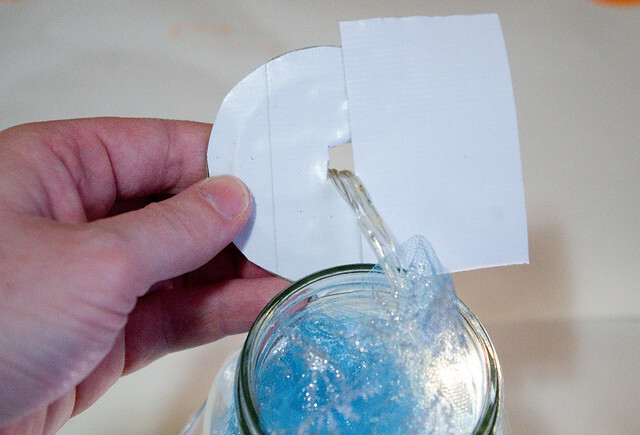 If you’re using a piece of card/paper, that should be between the lid and the jar. 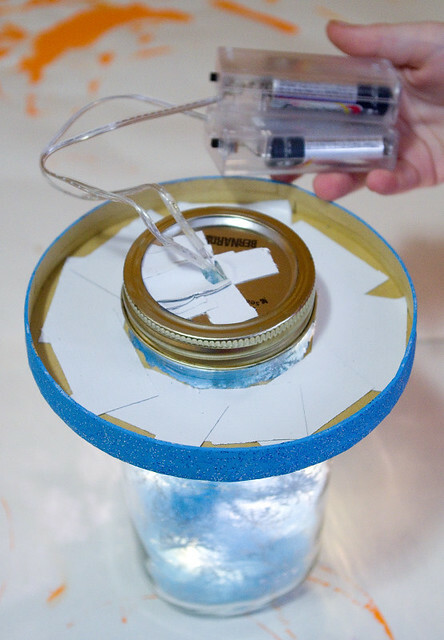 If you’re using a one-piece lid, you should do this step before you fill the jar with the lights and fabric. 12. 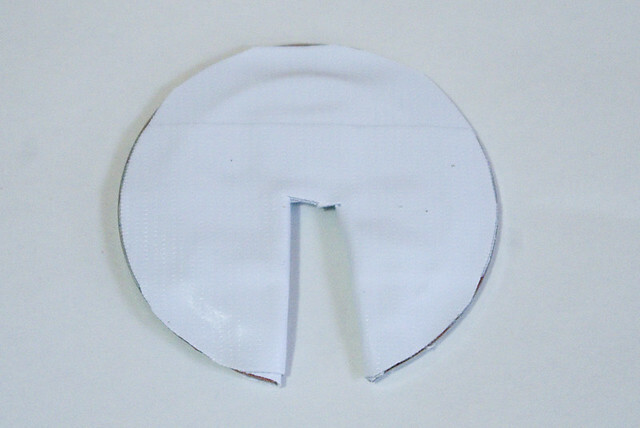 Using a piece of duct tape in a coordinating colour, cover most of the hole. 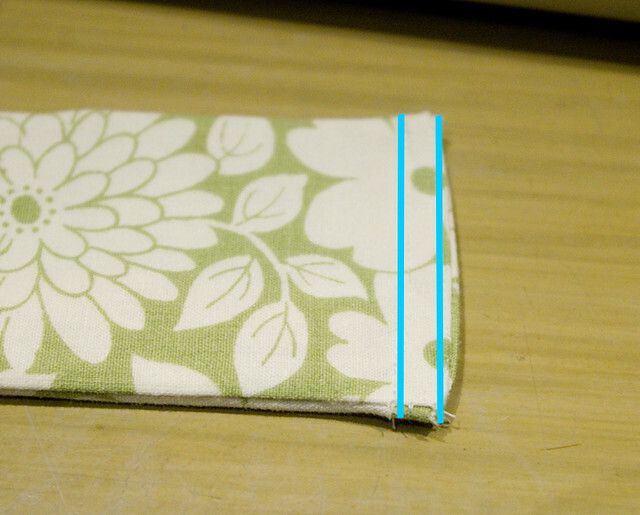 If you’re using the card/paper layer, this tape can be any colour. This step is unnecessary if you’re using a one-piece lid. 14. Put the battery packs into the bottom of the box, then flip the jar and box lid over on top of the box bottom. To turn the lights off and on, just reach inside the box and flip the switch(es). If you like your lights simple, this can be the end of this craft. My kids wanted a bit more fun, though! 15. 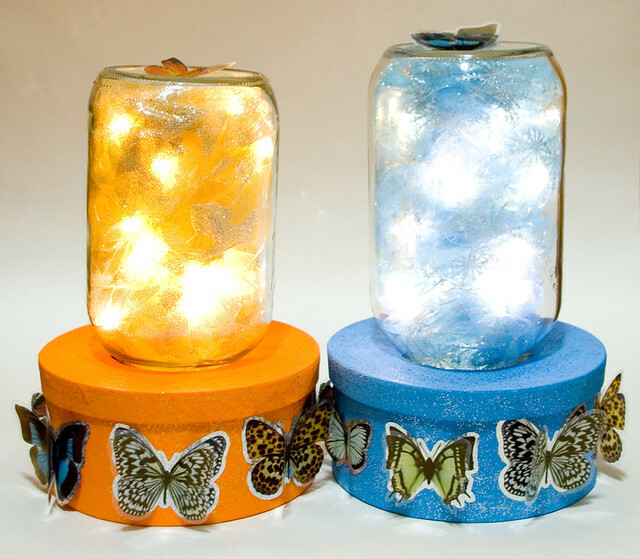 My girls really wanted to decorate their lanterns with 3D butterfly stickers, so that’s what we did. Honestly, any kind of sticker would work, although shiny ones (especially the faux-jewel kind) would reflect the light better. My girls made a lantern each in their favourite colours. 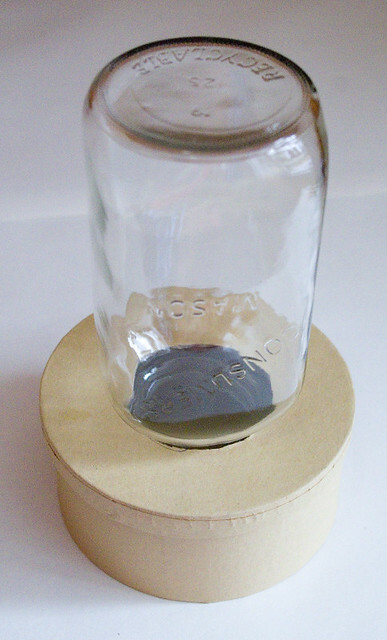 You may notice that the jars are slightly different because they’re from different manufacturers. The kids didn’t notice, though. The lanterns look especially nice in the dark, and they throw interestingly-patterned shadows on the wall. I promised Thing 2 that I would post a picture of her orange and gold lantern all by itself, since I’d done so many of Thing 1’s blue and silver one already. So there you go! 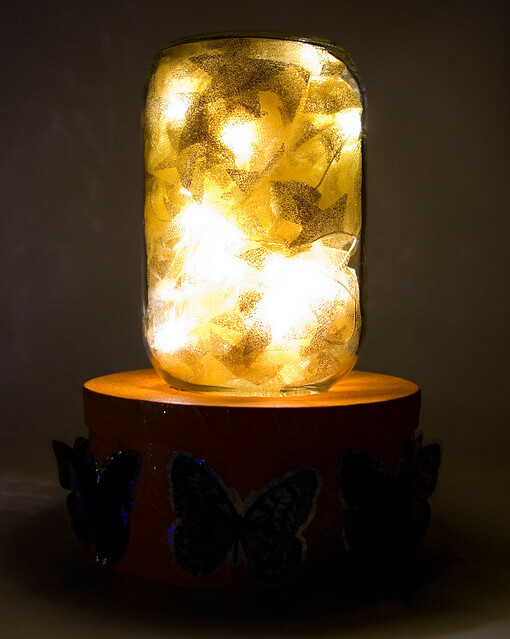 I hope that your kids enjoy making these fairy light lanterns as much as mine did! I grow most of my indoor plants (and some of my outdoor ones) in terracotta pots a) because I like the look of them, and b) because they’re inexpensive. I generally have a row of herbs growing in a window planter all year long. I was looking for a way to spruce them up for Halloween on the cheap. 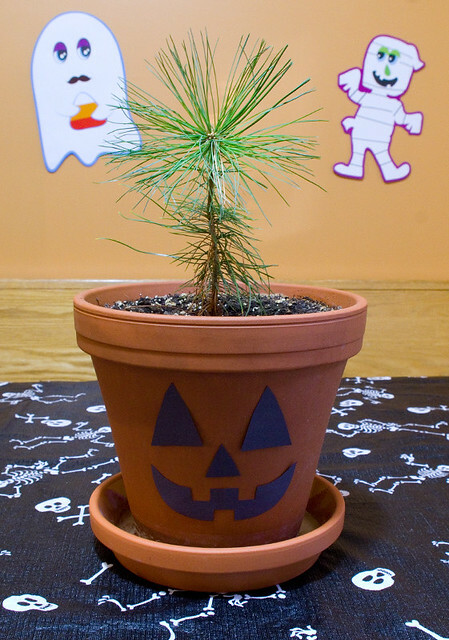 I came up with this quick craft — and I do mean quick, as in it took me less than ten minutes to decorate five pots. 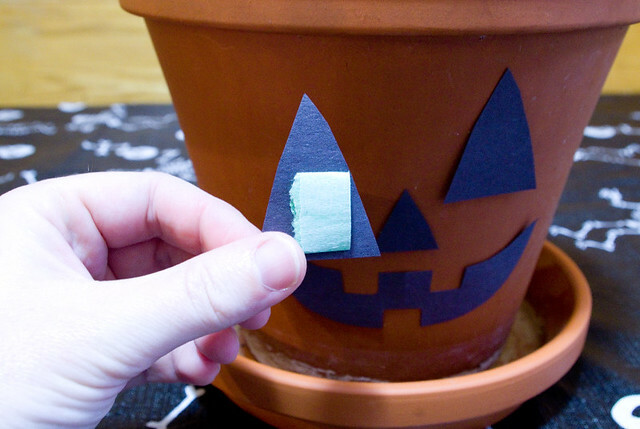 There are all kinds of tutorials out there for how to paint or draw on terracotta pots to make them look like Jack-o’-lanterns, which is simplified by the pots already conveniently being orange. I wanted something a little less permanent, since I didn’t want to have to re-pot my herbs for every holiday. I took a sheet of black construction paper and cut it out freehand into the appropriate shapes. If you’re not comfortable drawing or cutting freehand, you can always Google “Jack-o’-lantern face template” and either trace one of those designs or print it and cut it out. I then stuck the pieces onto the pot with tape. Any tape will work, but for something so temporary I prefer to use painter’s tape (any brand), which isn’t meant to stick forever and rarely leaves any sticky residue behind. I really like how they all turned out! 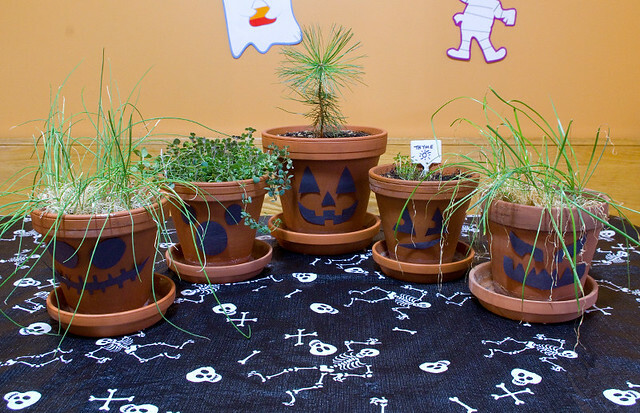 The plants in the pots make fun “hair” for the Jack-o’-lantern faces, which tickles my kids to no end. Those plants are, left to right: chives, oregano, baby pine tree (okay, technically not an herb; this craft will honestly work with any kind of plant, I just like how quickly and thickly herbs grow), thyme, and garlic chives. I think that this craft cost me maybe a quarter? Of course, I already had the potted plants. If you don’t have that, the pots generally run only a few dollars for the smaller sizes (they’re generally available at dollar stores and at WalMart all year round), and you can pick up a small pot of herbs for only a few dollars more at your local grocery store or garden center. As a bonus, after Halloween you can use the herbs in your cooking. 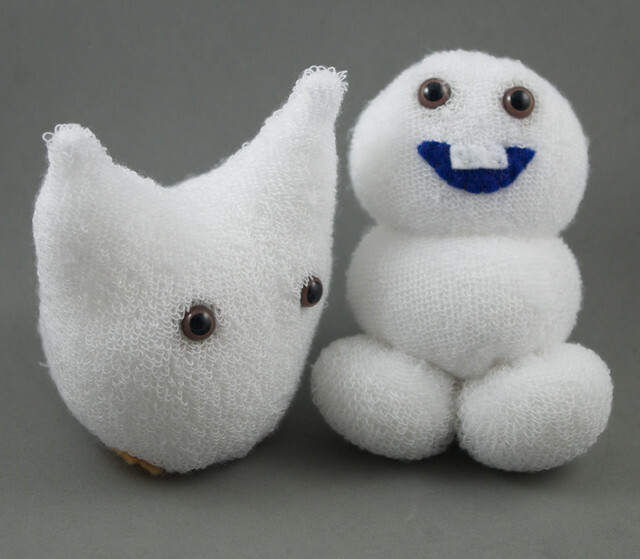 One of the standards of children’s crafts is sock creatures, usually starting with puppets and moving on to more complicated projects from there. 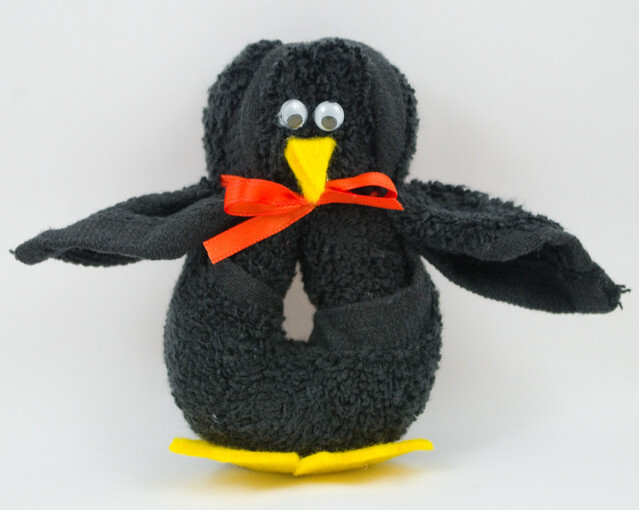 Sock creatures can be cheap, quick, and easy, which is exactly what you need with kids who can be easily frustrated when learning a new skill. 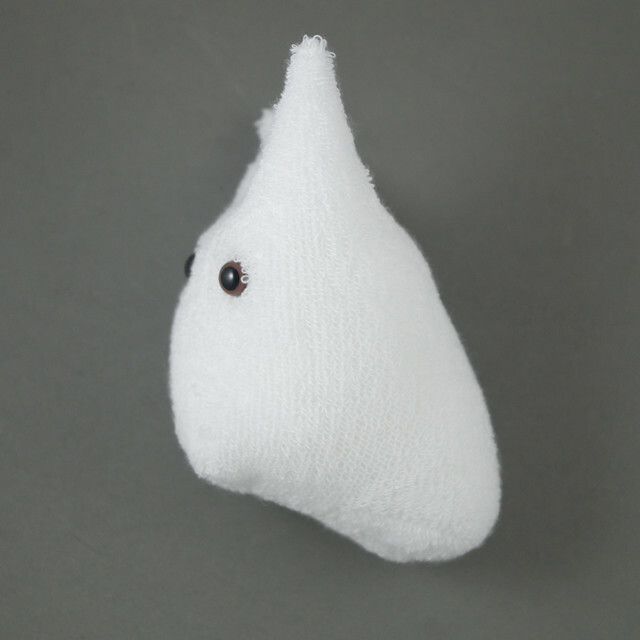 As a bonus, basic sewing is something that everyone should learn, and sock creatures are a great way to teach sewing without it even seeming like a lesson. I have made tutorials for two simple sock creatures based on characters from popular children’s movies. The first is Chibi-Totoro, who is the smallest of three adorable forest spirits from the 1988 movie My Neighbor Totoro. 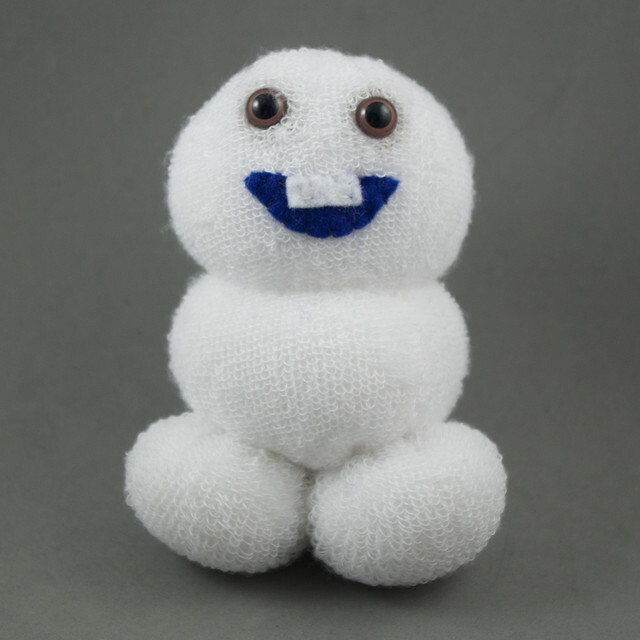 The second is a tiny snowman created by snow queen Elsa called a Snowgie, from the 2015 short Frozen Fever (which takes place in the same world as Disney’s Frozen). 1. 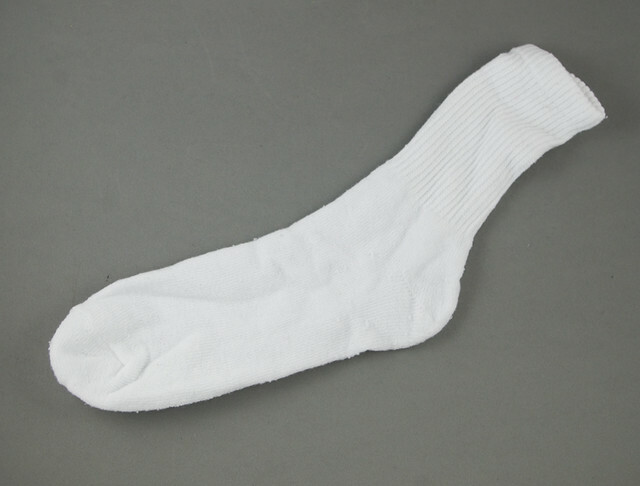 Lay the sock on a flat surface. 2. 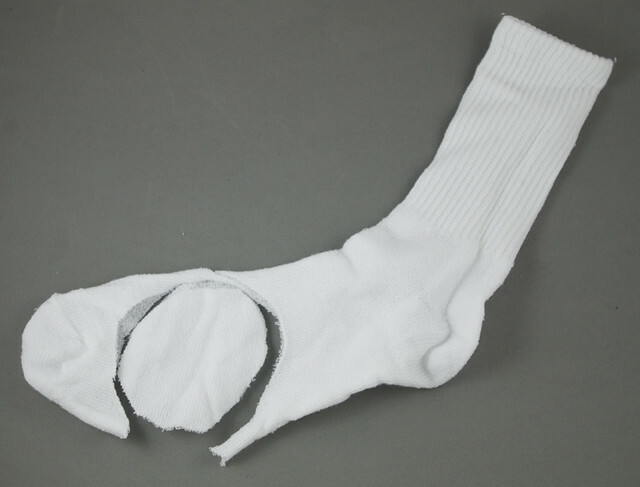 Using sewing scissors, cut the sock as per the above photo. 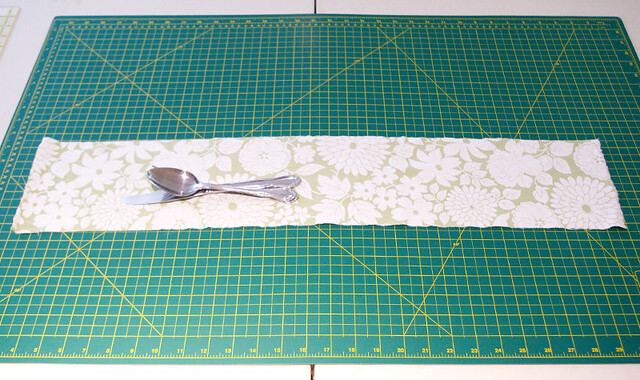 Discard the ankle and the toe, or save scraps for another project. 3. Turn the remaining piece of fabric sideways, so that the heel (which will be the tail) is at the back. 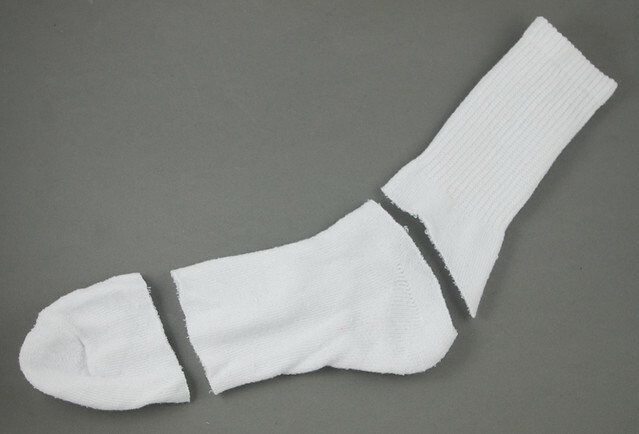 Cut a deep vee into the top of the sock. 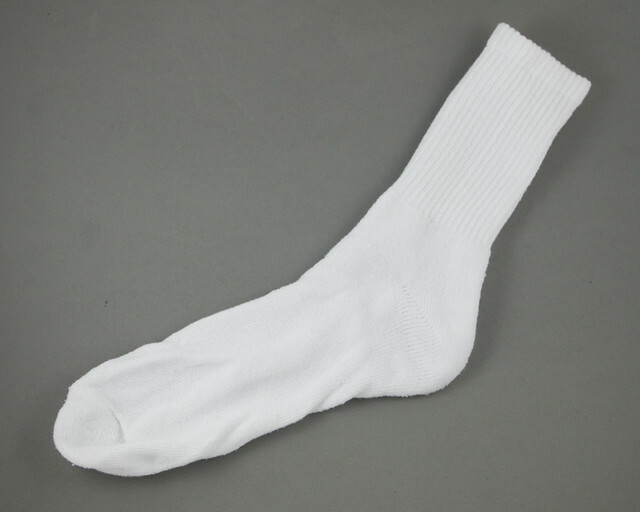 The actual measurements of the vee will depend on the size of sock you use. 4. Whip-stitch the top of the vee closed; this will become the ears. 5. 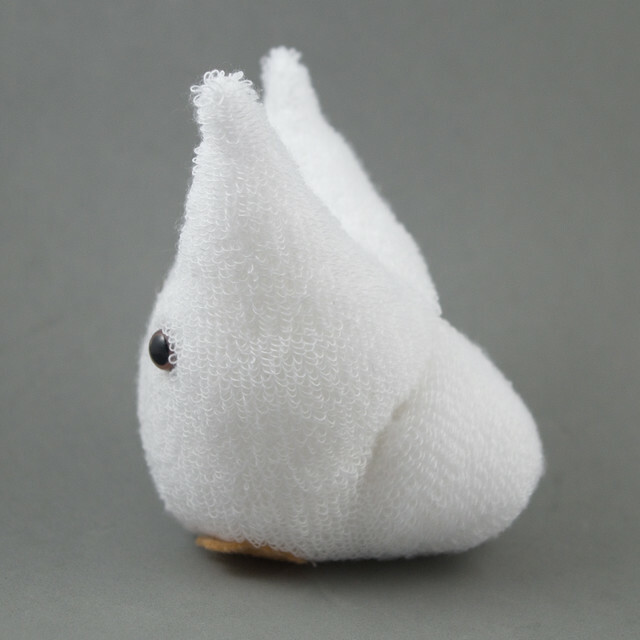 Turn the sock inside-out to hide the seam and to make the Chibi-Totoro as fluffy as possible. Attach safety eyes or sew on buttons. 6. Stuff the creature with polyester stuffing. Sew the bottom closed using an invisible closing seam; this will also ensure that the seam lies mostly flat. 7. Take a large stitch across the back of the stuffie where you want the join between the tail and the body to be. 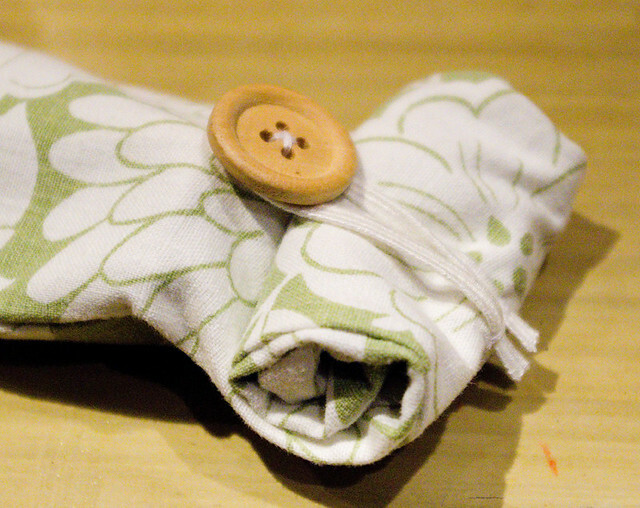 Pull the stitch tight and tie off, hiding the ends inside the body. 8. 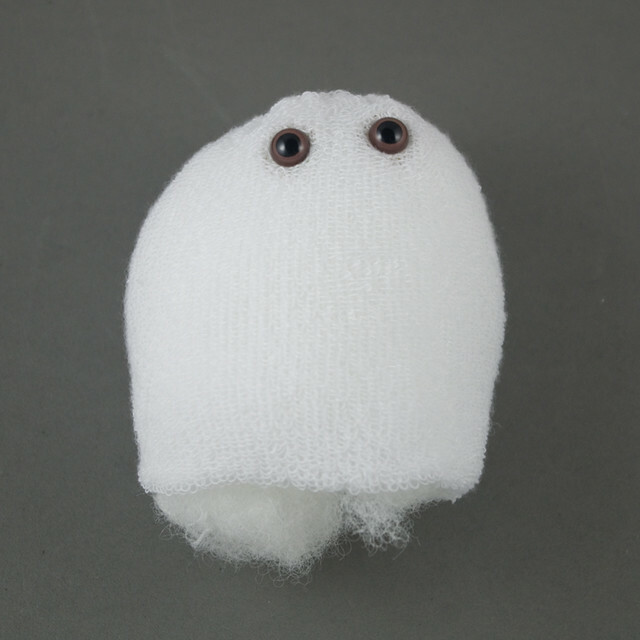 Cut out little clawed feet out of the felt and stitch them to the bottom of the body. 9. 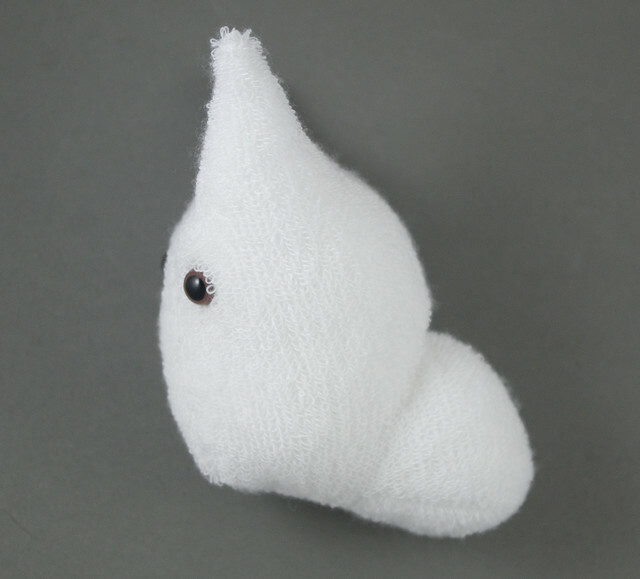 I discovered that my Chibi-Totoro would not stay up because its tail went down too far, so I took a big stitch from the back of the body to the top of the tail and pulled tight. This decreased the angle between body and tail so that the stuffie would stand up on its own. 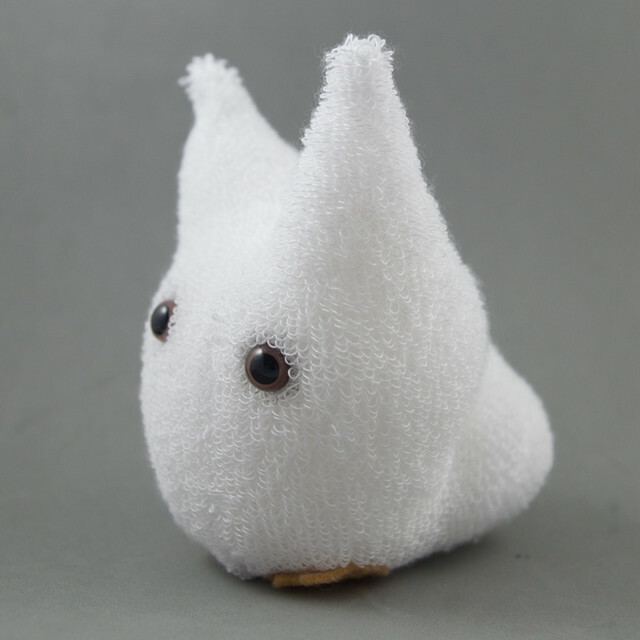 Now your simple Chibi-Totoro stuffie is ready to be played with! 1. Lay one sock on a flat surface. 3. 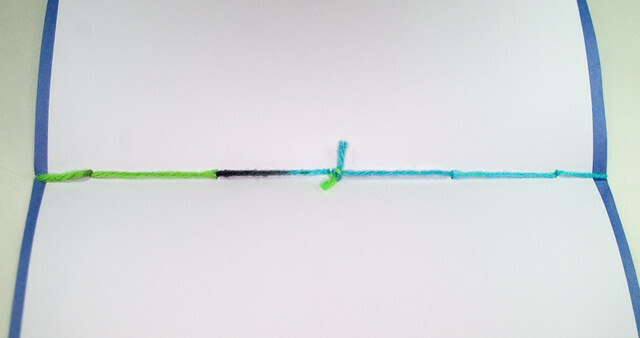 Do a running stitch around one end of the tube, then pull tight and tie off. 4. Turn tube inside out so that fluffiest side is on the outside. Attach safety eyes or sew on buttons. Stuff the creature with polyester stuffing. 5. 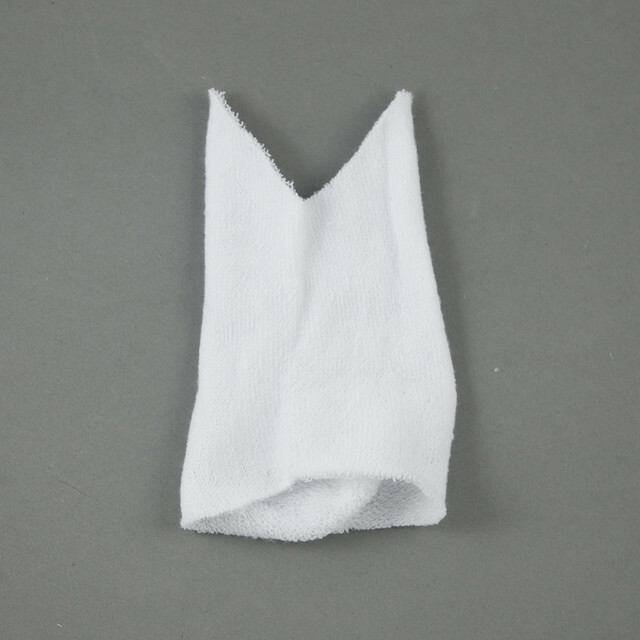 Gather the bottom of the tube together and sew tightly closed. Don’t worry if this isn’t perfect, as it will be hidden by the feet. 6. Wrap a doubled piece of thread around the middle of the tube and tie tightly, creating a head and a body. 7. Cut two rough circles out of the widest part of the second sock. These will become the feet. 8. Stitch a running stitch around the edge of one foot, fuzziest side of the fabric facing out. Stuff the foot. Pull the running stitch as tight as possible and tie off. Repeat for second foot. 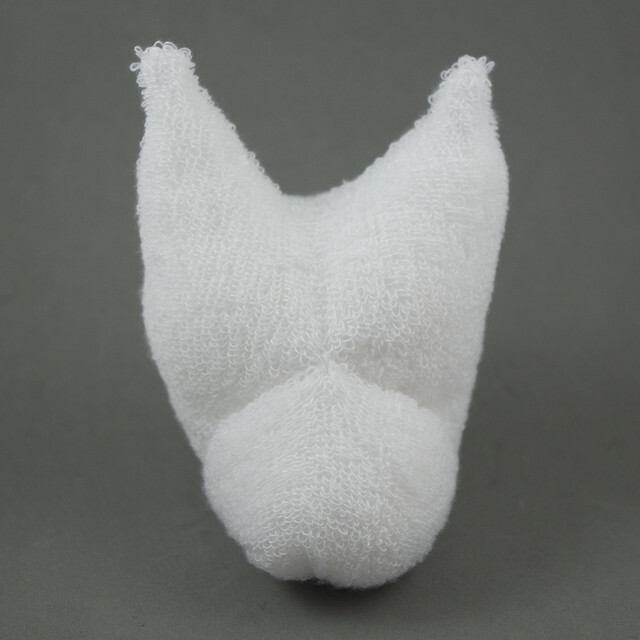 Sew both feet onto the bottom of the body of the stuffie. 9. 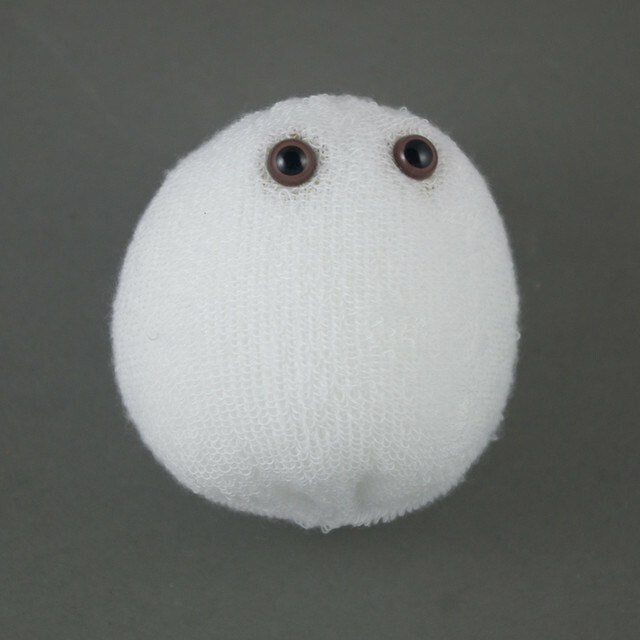 Cut mouth and teeth out of felt scraps and sew onto face of stuffie. 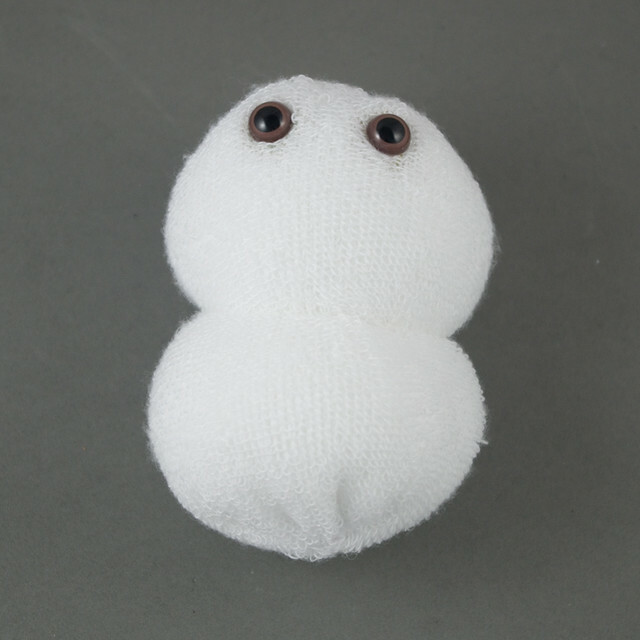 Your Snowgie is now complete! 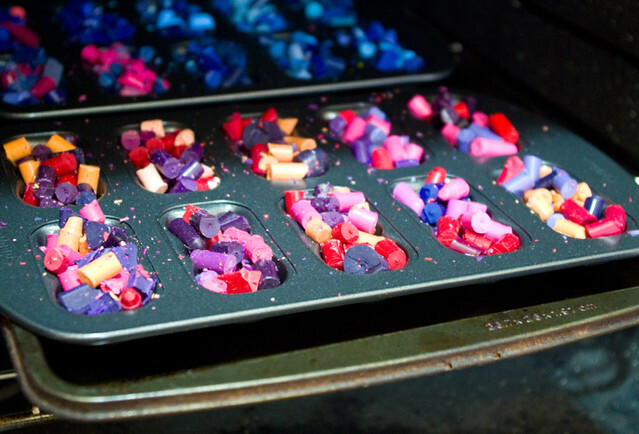 Back in Girl Guides, we recycled our crayons by melting them in the microwave or in a double boiler, then pouring the different colours in layers into muffin tins (waiting for the wax to cool a bit between layers so they didn’t mix). I wanted to do something a little simpler than that with my kids yesterday — since they are younger than I was when first did this craft, I wanted a process that involved less handling of molten wax. However, this is still an activity that is done with kids, as opposed to setting them up and letting them go. 1. 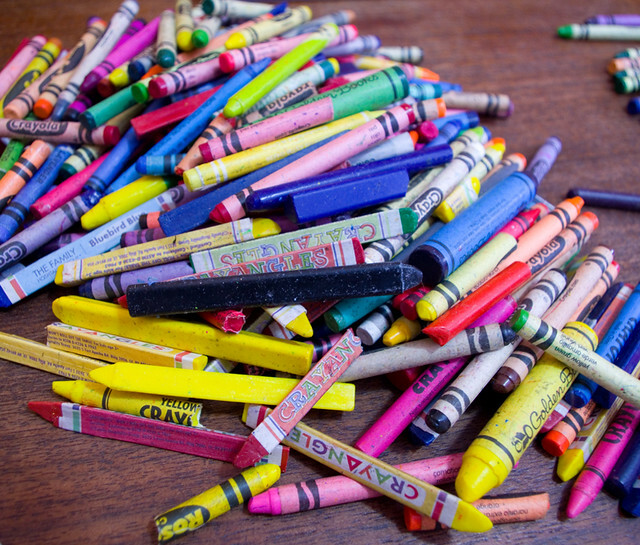 Sort through the kids’ crayons and separate out the old, broken ones, along with the ones that just don’t colour well. 2. Remove the paper wrappers from the crayons. The labels can be peeled off with your fingernails. 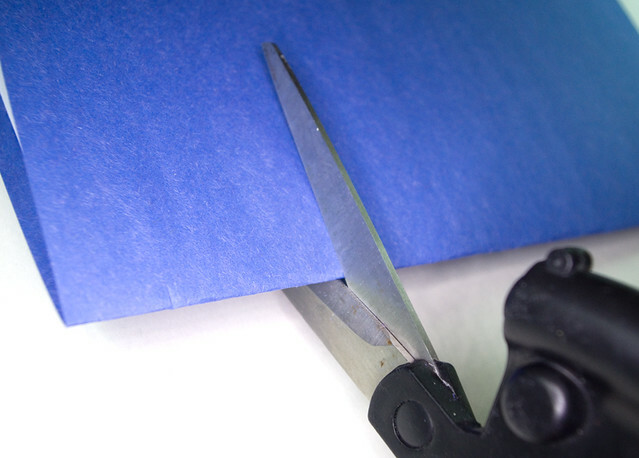 However, the quickest way is to run the blade of a utility knife lightly down the paper to slit it, then peel it off. When I was doing it with my kids, I would cut the paper, and they would take it off. 3. Sort the crayons by colour. 4. Protect the work surface with a cutting board, then use the large knife to chop up the crayons into chunks that are approximately 1cm (0.4″) long. Sharp knives should be handled by an adult. 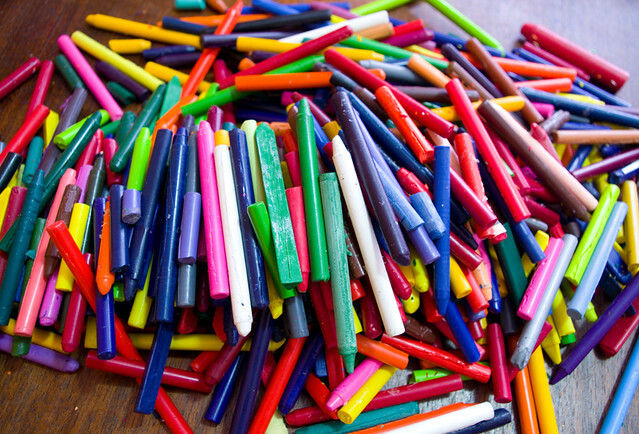 Alternately, put each colour of crayon into a clear zipper bag, seal the bag, and smash the crayons into large chunks with a hammer. 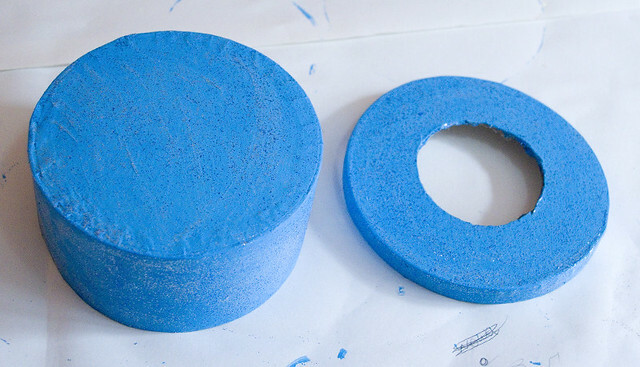 This may damage the surface underneath and will be noisy, so I suggest working on a concrete surface with a cutting board over top, and using ear protection. 5. 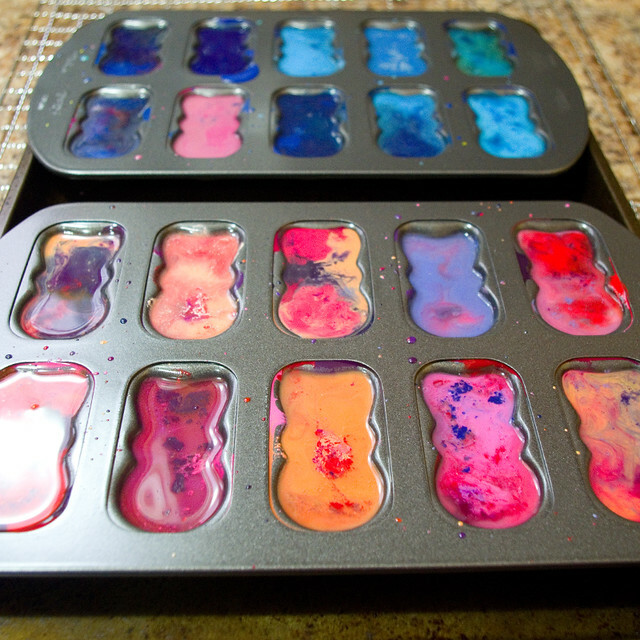 Fill the molded cookie pans or silicon molds or muffin tins with the chunks of crayon. 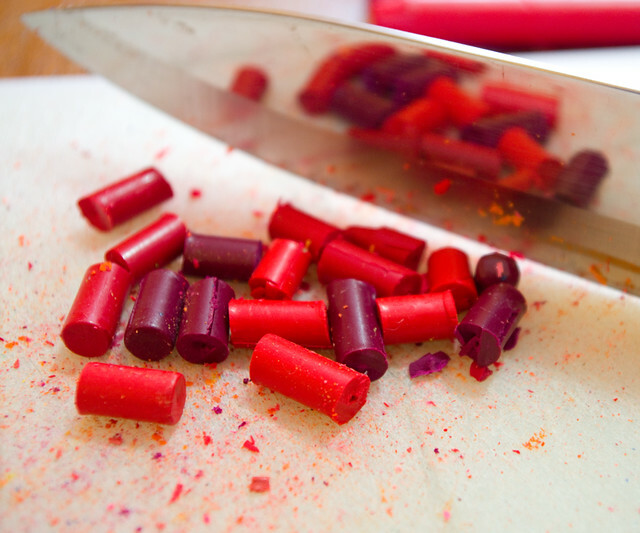 The molds should be almost overflowing, as the air pockets between crayon chunks will be filled as they melt. 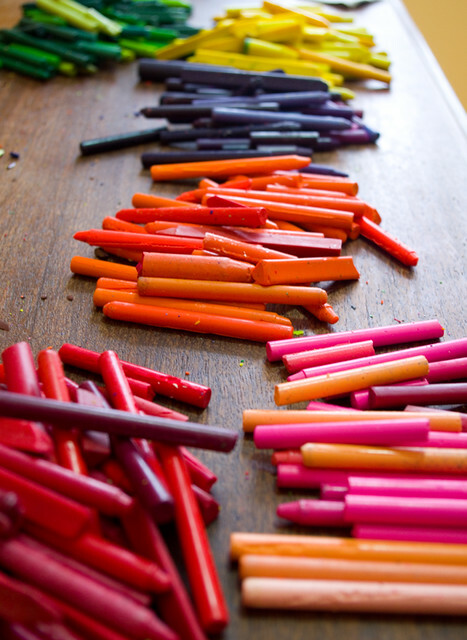 To create colour-coordinated crayons, fill each compartment with different shades of the same colour. To create more contrast, add chunks of coordinating colours. Be careful not to mix too many colours, though, as the colours will mix and they may turn an unlovely brown. 6. Preheat the oven to 200°F (93°C) (the oven temperature needs to be low so that the wax doesn’t catch fire). 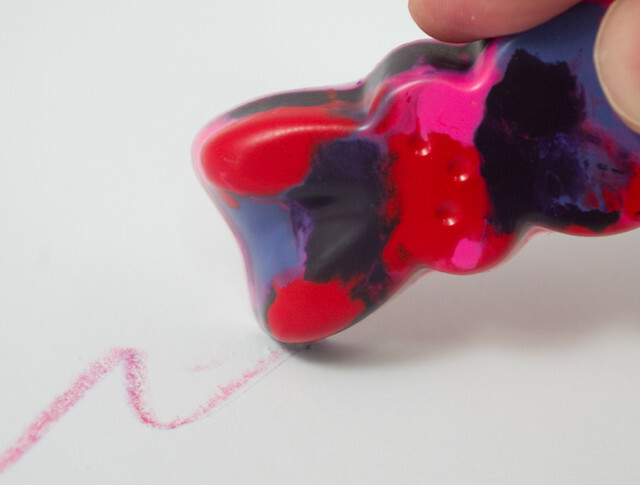 Put the crayon-filled molds on top of the flat cookie pans for support; this is especially important if using silicone molds, which are flexible. Anything to do with the oven should be done by an adult. 7. Bake until crayon chunks are thoroughly melted, 15 to 30 minutes, checking every 5 minutes after first 15 minutes is up to see if there are still any lumps. Remove trays carefully from oven, being careful not to spill the wax. 8. 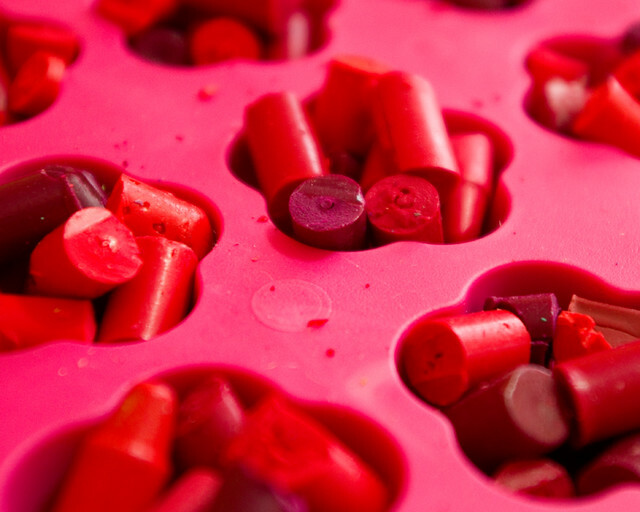 Cool the recycled crayons thoroughly before removing them from the molds. 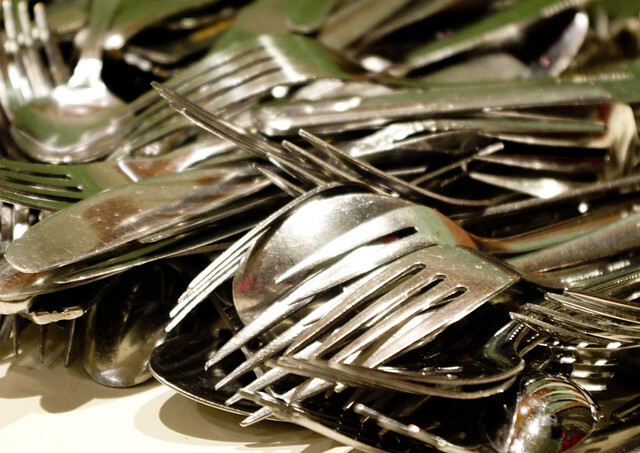 To make removing them easier, place them in the freezer (or anywhere outside in winter in Canada, so long as it’s protected from precipitation) until thoroughly chilled. Wax shrinks when it gets cold, so it will pull away from the sides of the mold and slide out more easily. 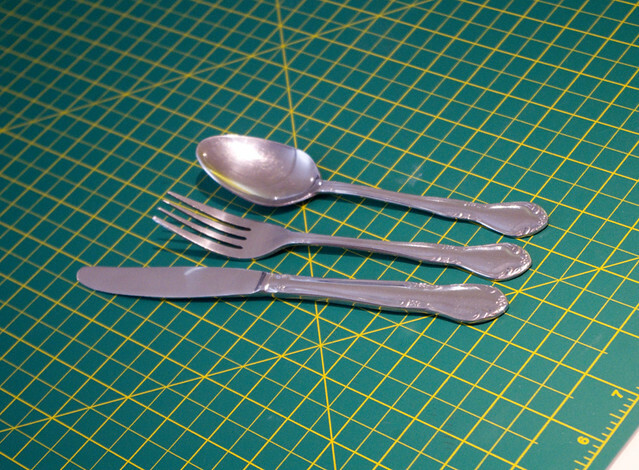 All in all, I much preferred the metal pans to the silicone versions. We packaged these crayons up into little spring-themed bags and put them aside until the week before Easter to give out at school. Of course, we had to leave a few out for the kids to colour with right away, too. It’s day two of March Break, and it’s still much too cold for this time of year. That means more crafts with the kiddos! 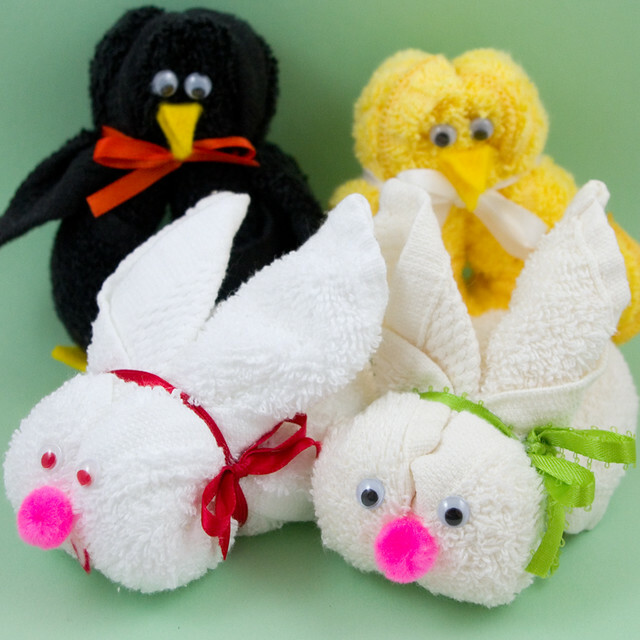 Today’s craft was booboo bunnies and chicks, for which I have created a brief tutorial. They’re really very simple. You may be wondering why are they called “booboo” animals. Well, it’s because the hole in the back of the animals caused by a loop in the fabric makes a great place to tuck an ice cube. 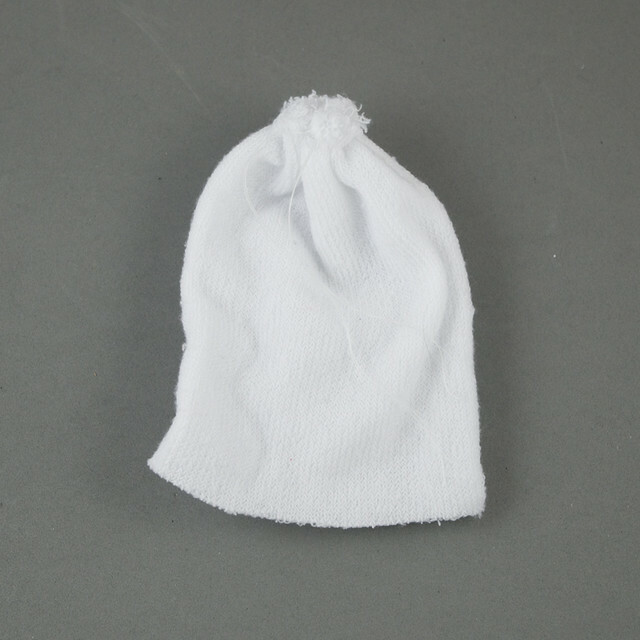 The ice cube can then be applied to a child’s booboo without it getting their hands cold, and without it dripping all over the place. As an added bonus, the cuteness of the animal distracts the child from their injury. But don’t think that this is their only use! 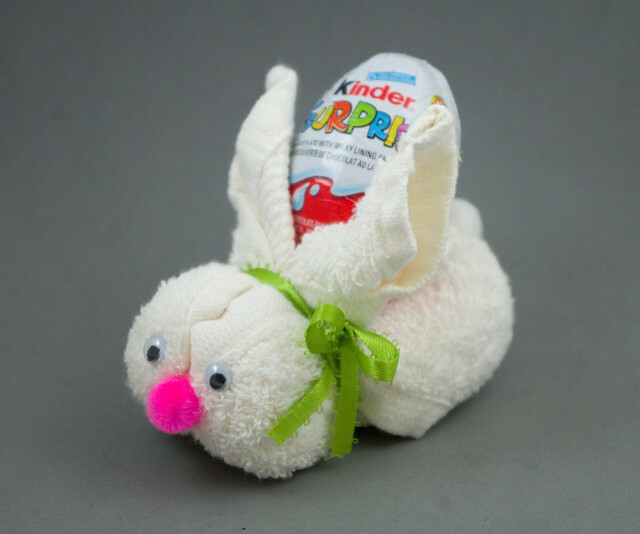 The hole in the back makes for a great place to stash an Easter candy; I’ve seen them made with beach towels so that one of those jumbo Kinder Eggs can fit inside. 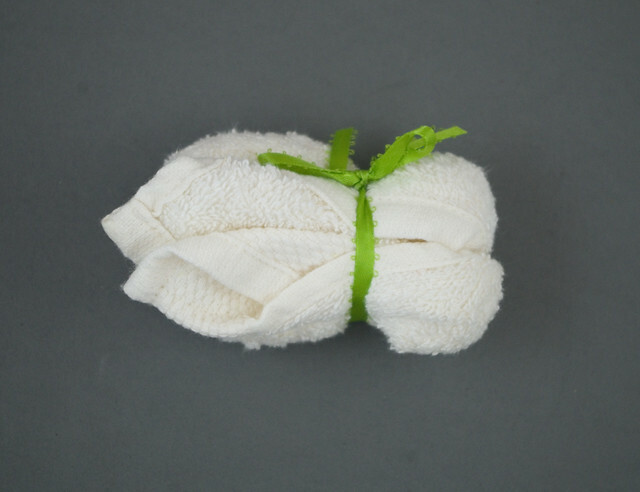 I’ve also seen them used as a creative way to present washcloths at a baby shower. 1. 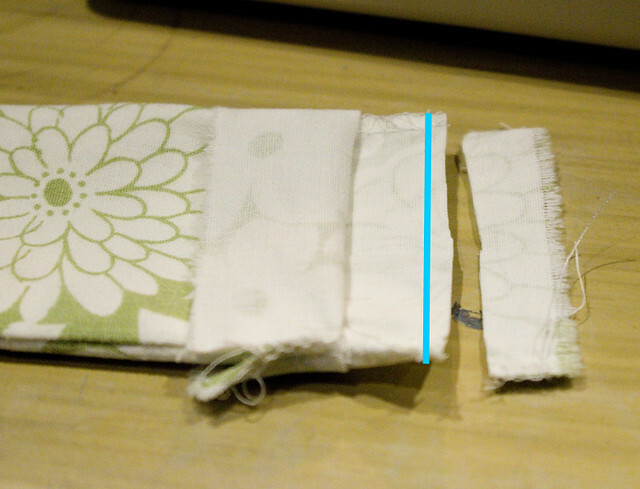 Trim tags off of the cloth, if there are any. 2. 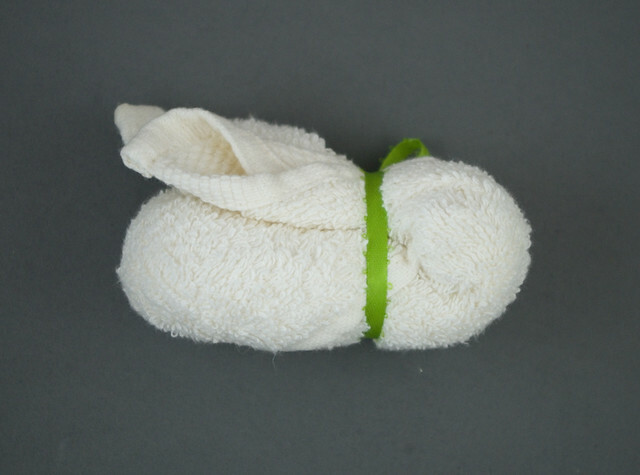 Starting at one corner, roll the cloth diagonally until you have a tube. 3. 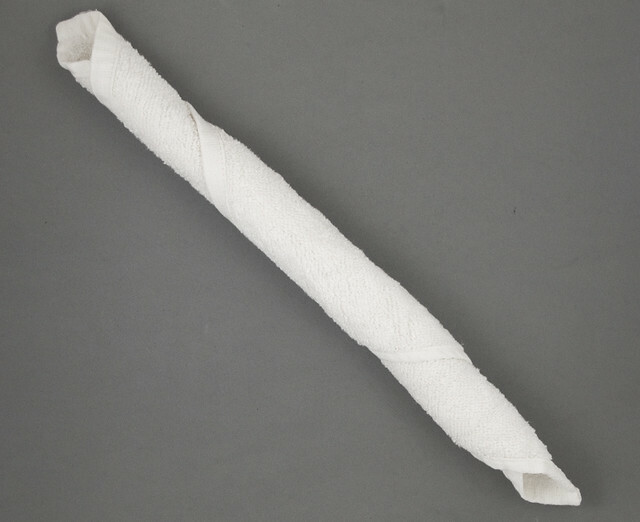 Keeping the tube rolled tightly, fold it in half. 4. Keeping the tube rolled tightly, fold the open ends of the tube backwards. Secure by tying the ribbon tightly around the cloth, about 2/3 of the way along. 5. Tie the ribbon into a bow. Trim the ends with the scissors. 6. Using the hot glue gun, stick the two halves of the face securely together (otherwise it will look like a bum). 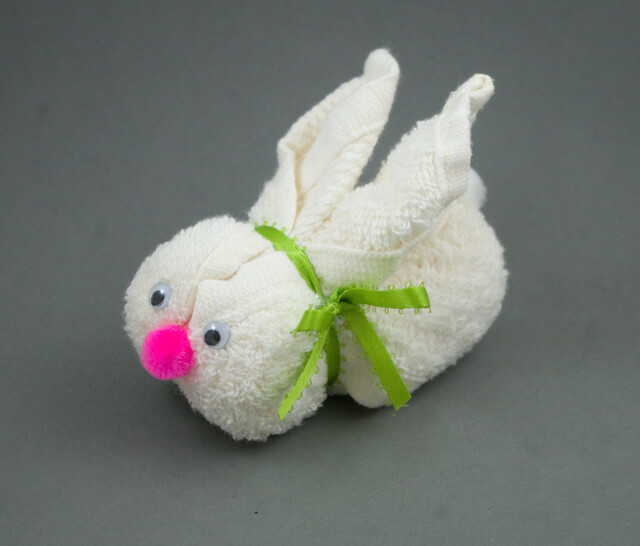 Glue the eyes, nose, and tail to the bunny. 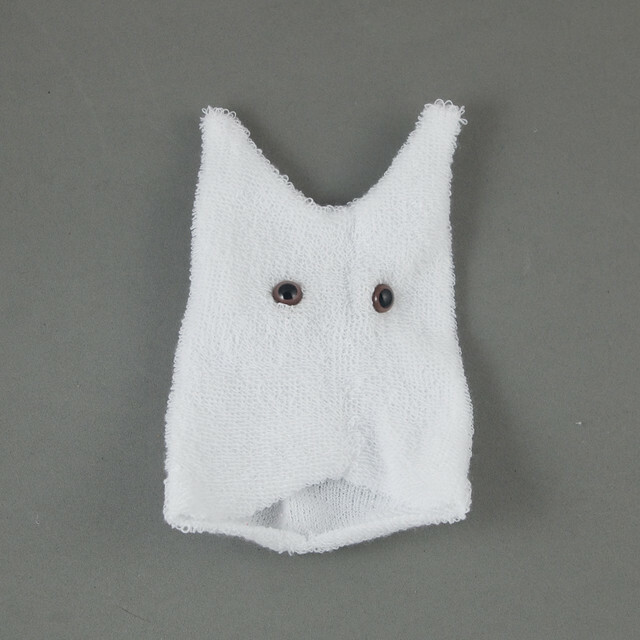 Alternatively, sew the face together, and sew on the eyes, nose and tail. 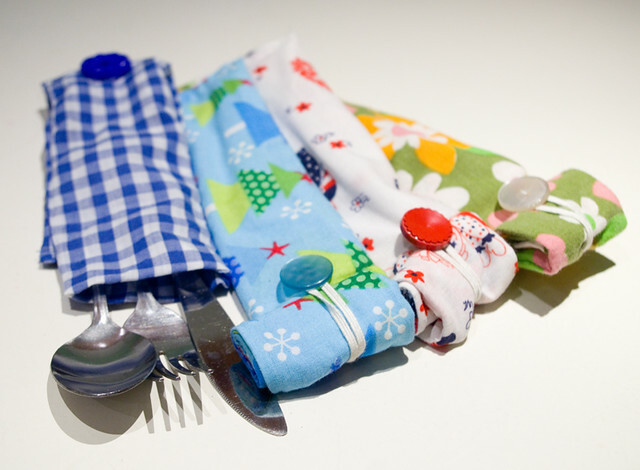 Sewing is the preferred method if you plan on using the cloth for other purposes at a later date. 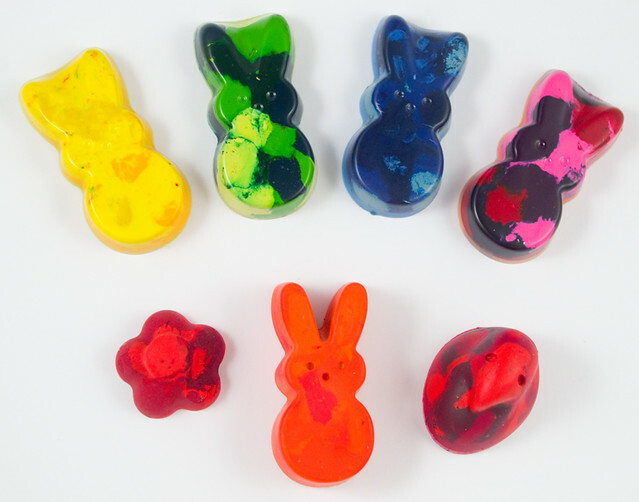 Don’t forget, booboo bunnies can be any colour of the rainbow! 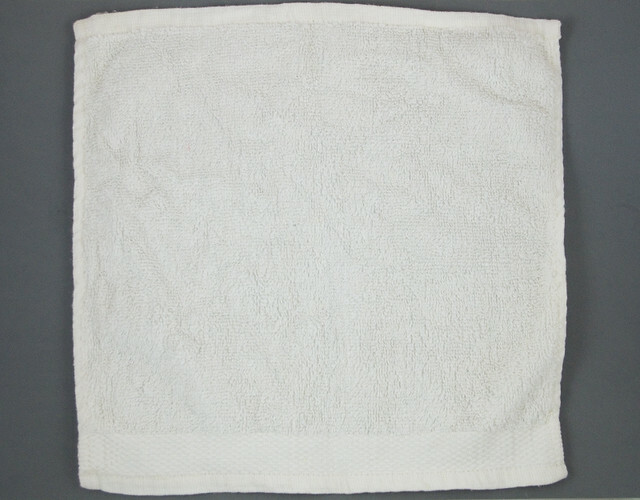 I just made white ones because that is the easiest colour of face cloth to find (and the cheapest). Don’t be afraid to experiment with decorating the bunnies, either. 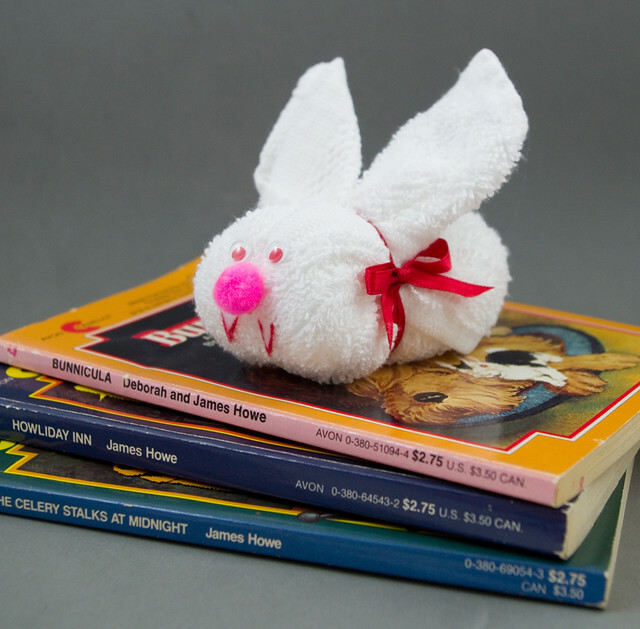 Above I added some glued-on felt “fangs” and used red googly eyes to create a “Bunnicula”, after a creature from a favourite childhood book. Be creative! 1. to 3. 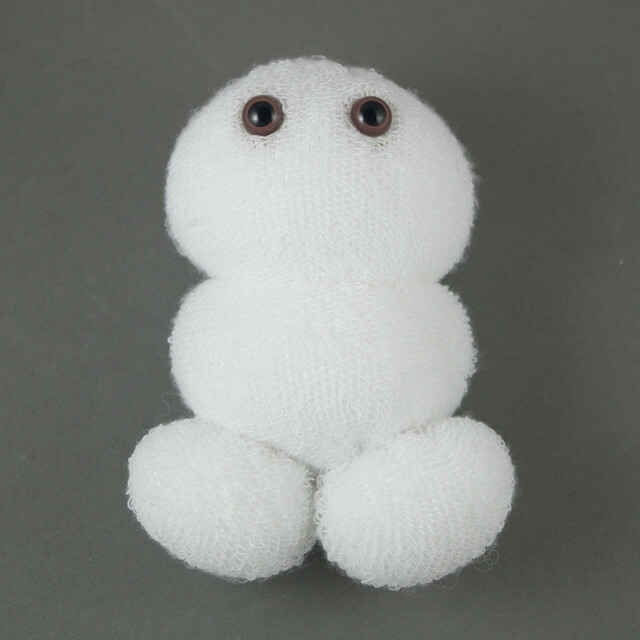 Follow steps 1-3 of the Booboo Bunny tutorial. 4. 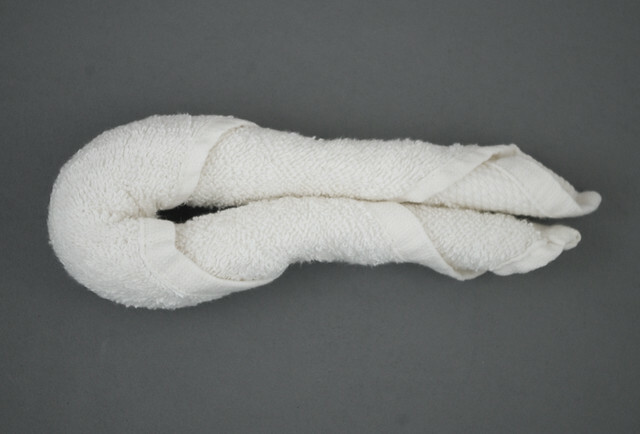 Instead of folding the cloth roll back on itself, fold it to either side, creating an “M” shape. Secure by tying the ribbon tightly around the cloth, about 2/3 of the way up. 5. 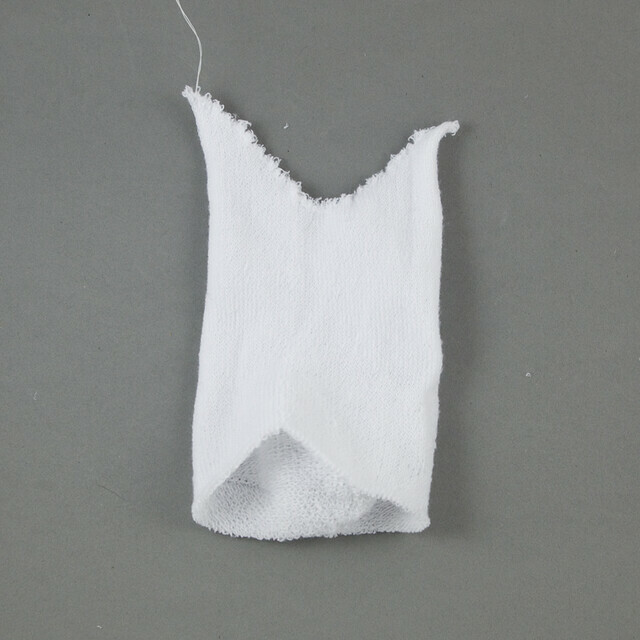 Cut out scraps of felt for the beak and feet, proportionate to the size of the cloth that you are using. 6. Glue both sides of the head together, then glue on the felt pieces and googly eyes. 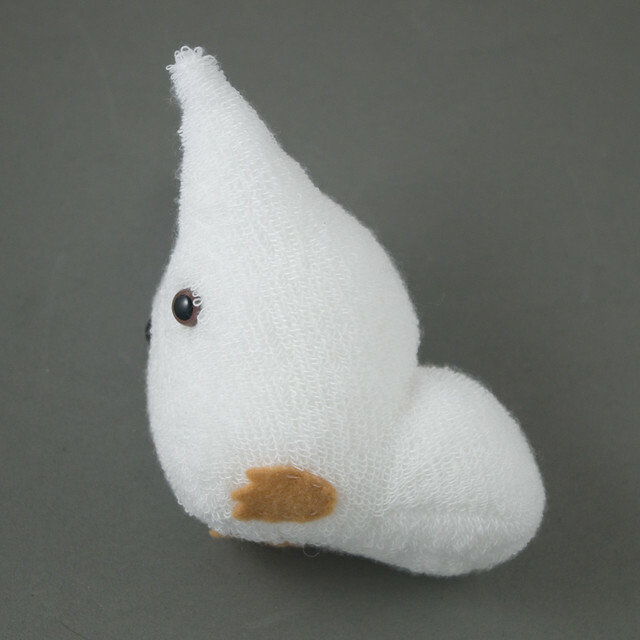 Alternatively, sew the face together, and sew on the eyes, beak, and feet. Once again, be creative! A chick easily turns into a penguin if you use a black cloth. Bunnies and chicks! Now you’re all set for spring. Around here there are indoor play places and child-friendly museums open year-round; rec centers have special events planned; most businesses have something going on to entertain the kids. But one thing that having a huge chunk of the under-fourteen demographic off school all at the same time means is that everything is packed. So in our house we choose to make our own fun rather than wait in line or squeeze through the masses. 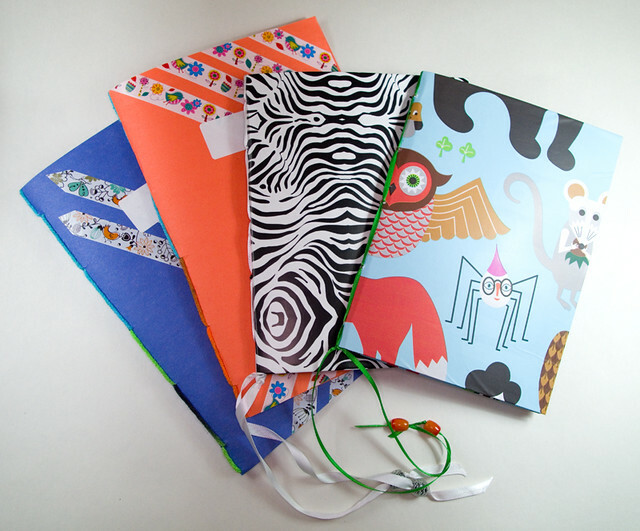 With that in mind, here is a tutorial for one of my kids’ favourite crafts: beginner books. There are two versions: one for the younger crowd, which only requires mastery of a pair of scissors and a blunt darning needle, and a slightly fancier one that requires more sophisticated tools, a bit of patience, and more adult supervision. 1. 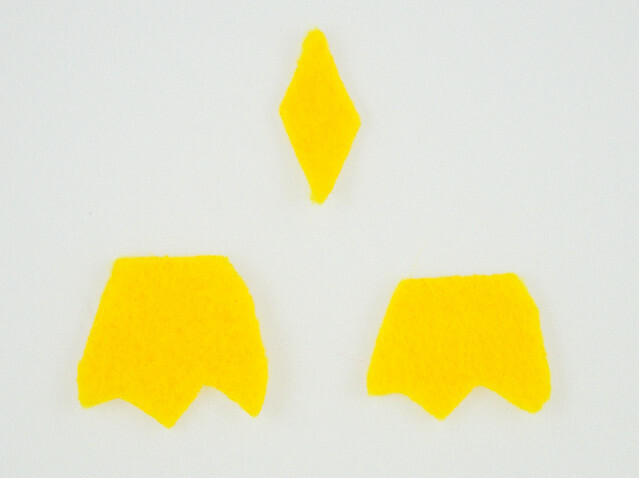 Put your construction paper and blank paper on a flat surface. 2. Fold the construction paper in half. Fold the stack of blank paper in half. 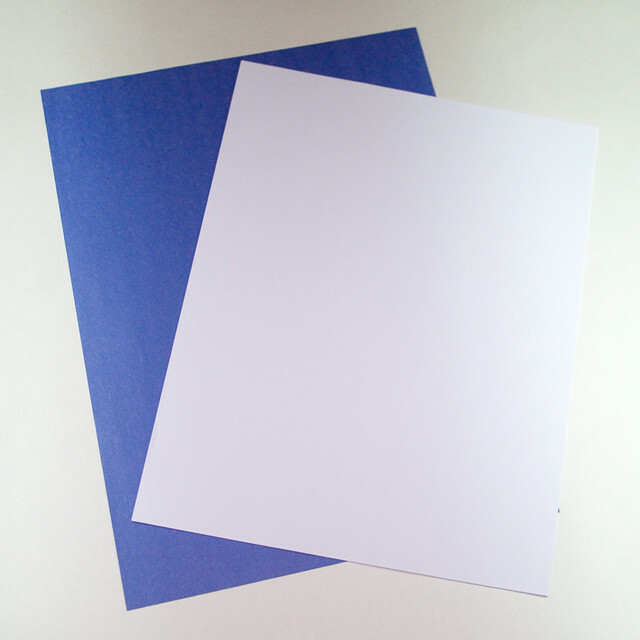 Place the blank paper inside the construction paper. 3. 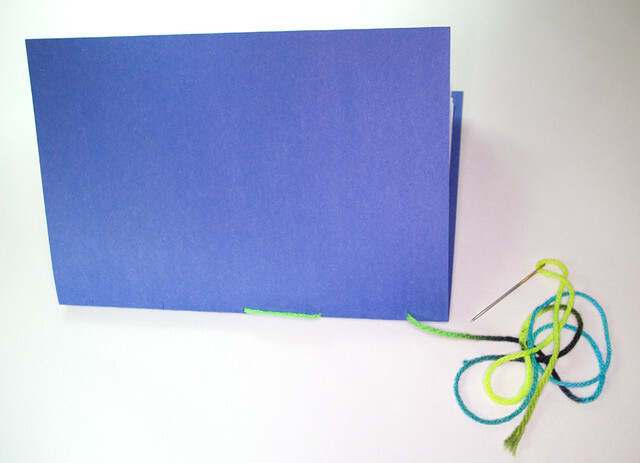 Using the scissors, cut five small slits along the folded edge of the booklet. For best results, work from the center out. Make sure that the slits go through all of the papers. 4. Thread the darning needle with the wool. Starting at inside of the the center slit and leaving about a 3″ (7.6cm) tail behind, start stitching in one direction (it doesn’t matter which). 5. 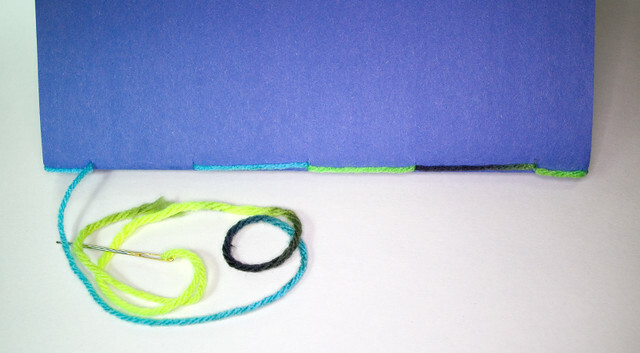 When you reach the slit closest to the edge, wrap the yarn around the edge and come back up through the same hole, then continue stitching in the reverse direction. Make sure to tug the yarn snug, but not so tight that it crinkles the paper. 6. When you get to the other end of the book, wrap the yarn around the edge as you did for the opposite end, and continue stitching. 7. Stitching this way should eventually bring you back to the center of the book on the inside. Keeping the yarn snug, but once again not so snug that it wrinkles the paper, tie a double or triple knot in the yarn. Trim the yarn to about 1/2″ (1.25cm) long. 8. 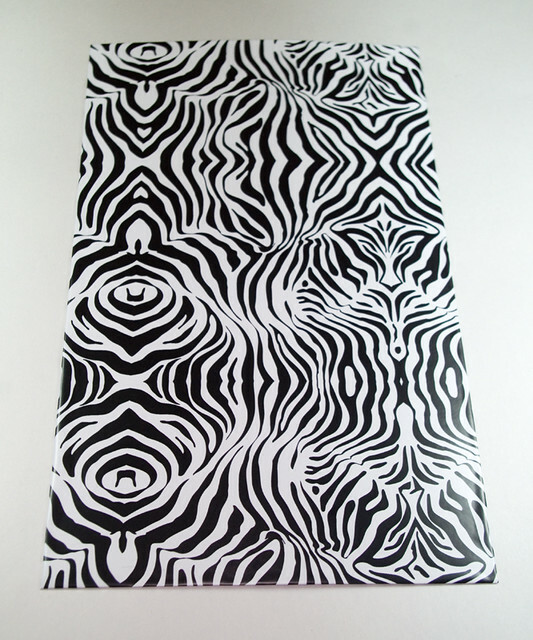 If desired, decorate the cover of the book, as per the first photo. Your book is done and ready to be filled! 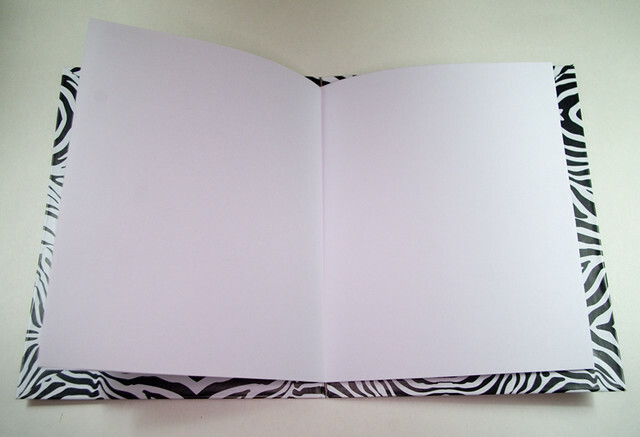 Finished fancy book using dollar store contact paper. 1. Trim the largest flat part of your cereal box until it is rectangular. 2. 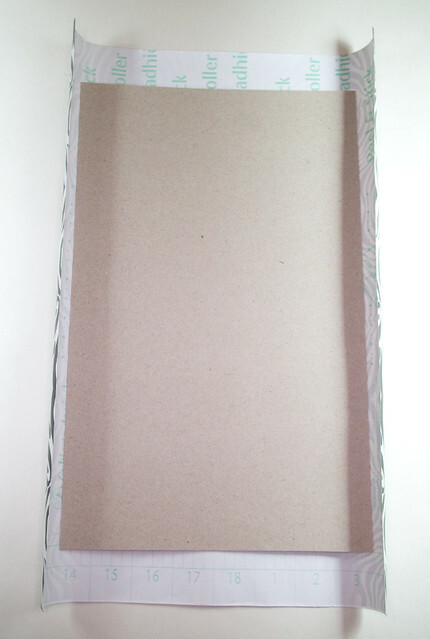 Trim your contact/wrapping/wall paper until it is 1″ larger all around than the cardboard. 3. Peel the backing off of the contact paper and adhere it carefully to the outside of the cardboard, pressing out air bubbles as you go. 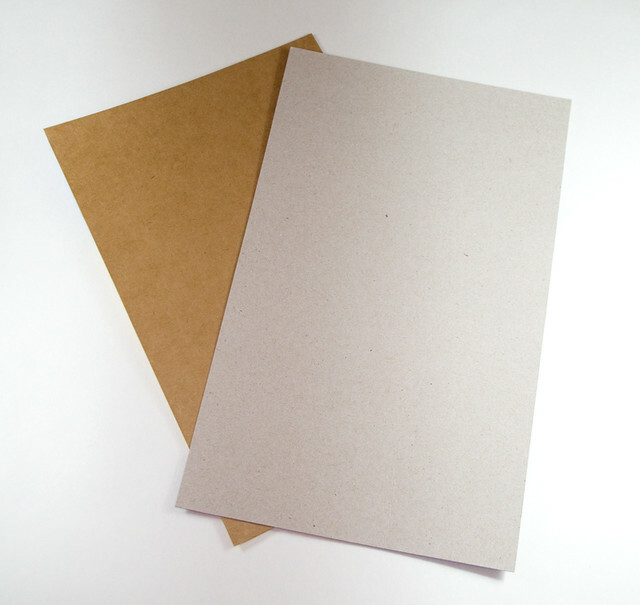 If you are using wrapping/wall paper, go outside and spray the cardboard with spray adhesive. (The spraying should be done by an adult.) Come back inside and place the sticky side of the cardboard on the back of the wrapping/wall paper. 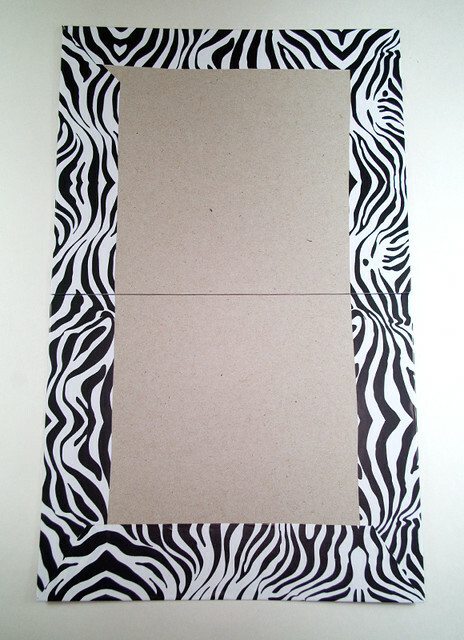 With any kind of paper, fold the excess to the inside of the box and trim the corners. 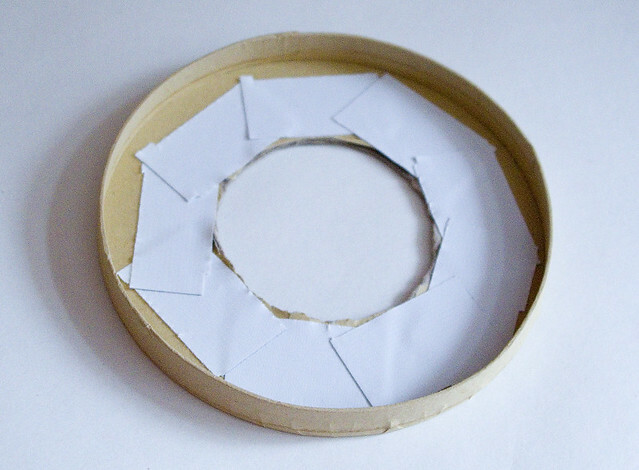 If using wrapping/wall paper, stick the excess to the cardboard using a glue stick. 5. Fold the cover in half along the scored line. 6. 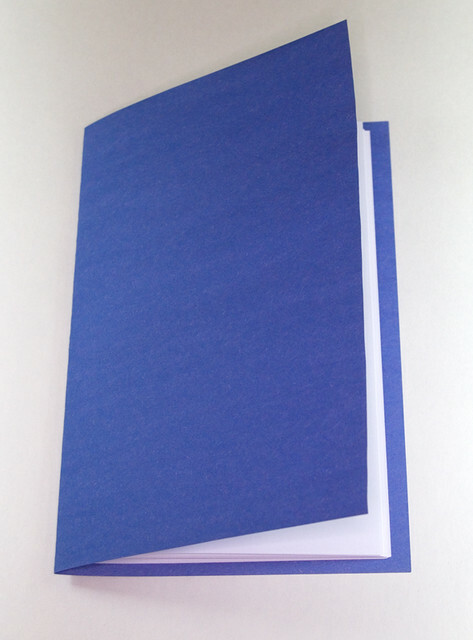 If necessary, trim your blank paper so that it is about 1/2″ (1.25cm) smaller all the way around than the cover. 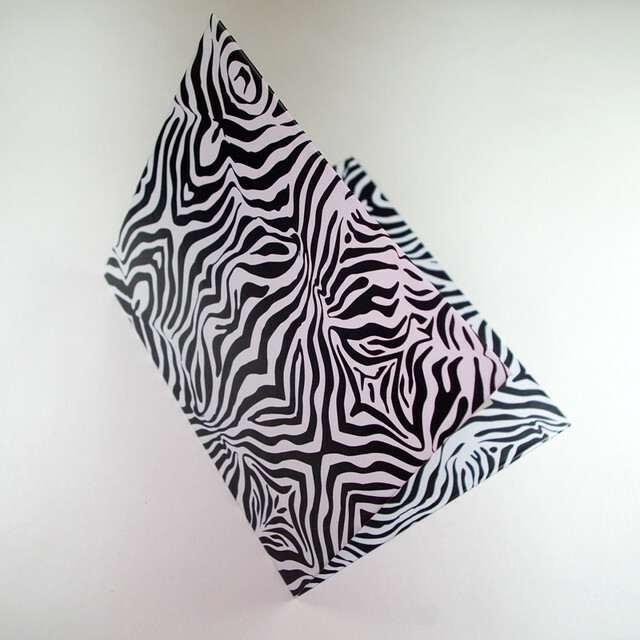 Fold the blank paper in half and line it up with the center of the cover. 7. Place the scrap wood under the spine of the book. Using the hammer and being very careful to keep the pages from moving, tap the nails through the blank paper and the cover all at once. For best results, work from the center out. Remove the nails. 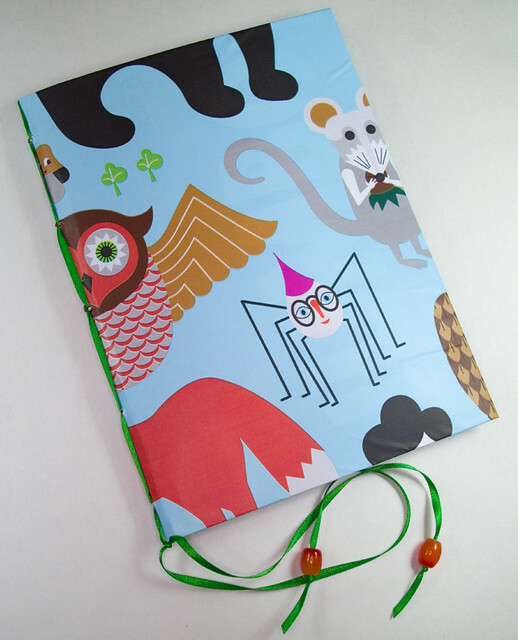 Finished fancy book using IKEA wrapping paper. 8. 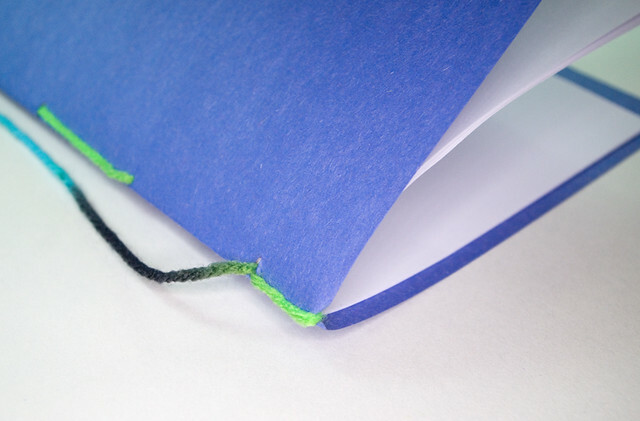 With the same technique as the basic book but starting at the bottom of the book, sew the spine together using the darning needle. Leave the tail much longer this time as ornamentation. To secure the ribbon, tie into a double knot at the bottom of the book. Thread one bead on each end of the ribbon and knot underneath to add a bit of pizzazz. Your book is done! 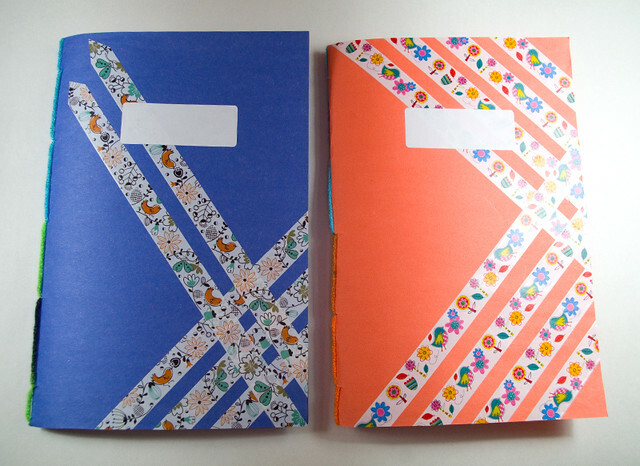 Optionally, you can use a glue stick to stick the first page to the inside of the front cover, and the last page to the inside of the back cover. This will create a more finished look. I hope that your kids enjoy this craft as much as mine do!